GSK: Is the FECRIS-branch of Austria Becoming a Shadow of Itself? 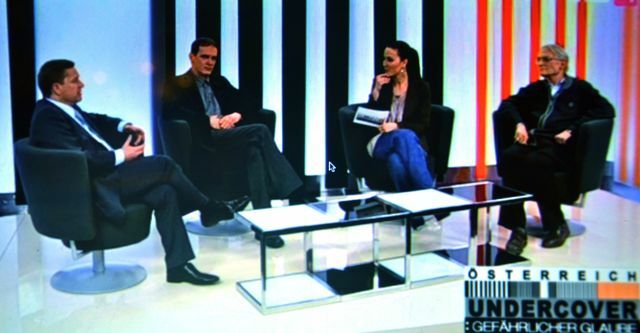 German Müller (Federal Office for Sect Issues, second person from the left) and Friedrich Griess (FECRIS/GSK, far right) are speaking at a talkshow that was broadcast on April 4, 2011. At this point, public subsidies for GSK had already been significantly curtailed. Vienna/Austria, 10.11.2016 (HRWF) – The landmark survey “Freedom of Religion or Belief – Anti-Sect Movements and State Neutrality. A Case Study: FECRIS” published in 2012 already contained a comprehensive description of the affiliates of the European anti-cult formation FECRIS active in Austria, most notably the GSK, by Christian Brünner and Thomas Neger. The objective of this documentation is to present a snapshot of the intricate situation of the GSK in 2016 by reviewing its background, protagonists and methodology and by analyzing the diminished flow of public funds that used to sustain its activities. The “Association for the Protection of Mental Freedom” (Verein zur Wahrung der geistigen Freiheit) has been co-founded by Austrian psychologist Prof. Brigitte Rollett and officially registered in Vienna on the 29th of September 1977. In 1992 the association has been renamed as the Society against Sect- and Cult-Dangers (Gesellschaft gegen Sekten- und Kultgefahren, GSK). Rollett has ever since served as the president of the association and has been active for many years in the information war against religious minorities and the alleged dangers emanating from those groups. Prominent anti-cultists in Austria and trained psychologists such as Dr. German Müller, executive director of the Federal Office for Sect Issues (Bundesstelle für Sektenfragen) founded in 1998, or the executive director of the FECRIS-affiliated GSK, Dr. Martin Felinger, have studied under Rollett. Friedrich Griess DI, a retired engineer and committed Roman Catholic, was the third president of FECRIS from 2005 until 2009, and has become known for his aggressive activities against the Norwegian group Smith’s Friends (official name: Brunstad Christian Church), an evangelical non-denominational church founded by Johan Oscar Smith in 1905. Surprisingly, the GSK-protagonist Martin Felinger is not listed as an authorized representative of the GSK, although he professes to be its executive director since 1999 on his private website. He characterizes his work in a “private psychological counseling center” as offering “help and support” to “former sect members of destructive cults” [sic] and to relatives of persons who have entered “dubious groups of the diverse and problematic counseling market (Lebenshilfemarkt)”. Felinger’s language reveals that he clearly considers spiritual or religious alternatives to modern psychological counseling as tendentially superstitious, fraudulent and ineffective. The official website of the GSK only consists of an opening page that already for several years states that “the website is being reconstructed” and only provides basic contact information. On its one-page website the GSK declares itself to be a “member of the European federation FECRIS”. The given office address Obere Augartenstraße 26 – 28, 1020 Vienna is consistent with the address stated in the register of associations. However, there are no official opening times and contact can only be made via email or by phone. According to Felinger, the office is used as a meeting place on demand whenever he has counseling appointments with his “clients”. For one hour of counseling, Felinger charges 70,- EUR in cash. However, in the case that he is too busy for an urgent counseling session, he recommends his clients to speak with a “concerned father”, a pensioner whose daughter has been damaged by a sect. (Felinger is most likely referring to his co-worker Griess who has accused the Smith’s Friends of taking away his daughter, but lost several lawsuits against the group). When asked about his definition of a “sect”, Felinger explained that a sect is basically a group characterized by “a unique ideology” and “intolerance”. The GSK has so far never released any information on how much private funds it has raised, i. e. from churches or private supporters, or how much revenue it made from the persons it “consulted”. What is certain is that the association has been publically subsidized by the City of Vienna and the State of Lower Austria for a period of more than 15 years. However, the private anti-cult association has generally lacked transparency concerning the precise amount of total public funds it received and the ratio of public vs. private funding. 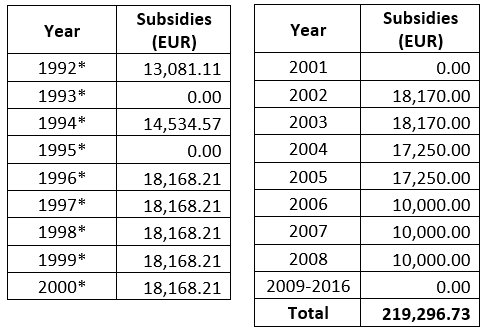 The local government of the City of Vienna has regularly approved the subsidization of the GSK from 1992 until 2008, resulting in a total funding expense of almost 220,000 EUR (see table 1). Due to pressure applied by civil society formations, i. e. the Forum for Religious Freedom Europe, who questioned the ideological motive, the incoherent methodology and unconstitutional objective of the GSK, public funding of the association has been put to a halt in 2009 (see figure 1). The amount of subsidies provided for this private anti-cult group serves as an objective indicator for the intensity of the “sect debate” that took place in the sector of public administration and the media in German-speaking countries during the 1990s and early 2000s. To date, this debate has largely faded and has been replaced by the discourse on migration, terrorism and radicalization. The second largest sponsor of the GSK was the State of Lower Austria, although a precise breakdown of funds allocated to the GSK has never been publicized. In February 1997, the State of Lower Austria introduced a publically funded “State Office on Sect Issues” (Landesstelle für Sektenfragen), administrated by Dr. iur. Peter Pitzinger, the director of the Family Department of Lower Austria (Familienreferat) since 1993 and a close ally of Friedrich Griess (GSK) and German Müller (Federal Office for Sect Issues). 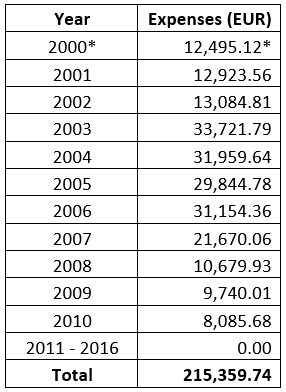 An analysis of the statements of accounts from 2000 until 2015 by the state of Lower Austria regarding the item “Landesstelle für Sektenfragen” demonstrates that a total of 215,359.74 EUR in public funds went into this project (see table 2 and the corresponding graph in figure 2). Table 2 – Expenses for the “State Office on Sect Issues” (Landesstelle für Sektenfragen) spent by the State of Lower Austria between 2000 and 2016 (in EUR, *converted from ATS to EUR). From 2000 to 2002, the State Office on Sect Issues was funded with ca. 13,000 EUR annually, whereas the amount was significantly raised in the following years. From 2003 until 2007, the office received funding between 21,000 EUR and 34,000 EUR per year. However, the annual budget for the office began to decrease steadily from ca. 31,000 EUR in 2006 to ca. 8.000 EUR in 2010, and seems to have been cut completely from 2011 onwards (cf. figure 2). Although the counseling center currently is not present online and has no physical address, the Office on Sect Issues of Lower Austria nominally still exists under the public resort “Social Support, Education and Family” (Soziales, Bildung und Familie). According to Mag. Vera Maria Streller from the “generations department” (Referat Generationen), any requests on the issue of “sects” or “cults” are now directly forwarded to the Federal Office on Sect Issues (Bundesstelle für Sektenfragen), since they have the “personnel and budgetary equipment being the competent information center for all of Austria” and “in order to avoid the duplication of administrative work”. The Lower Austrian State Office thus still exists as a paper tiger, but not as a real institution. 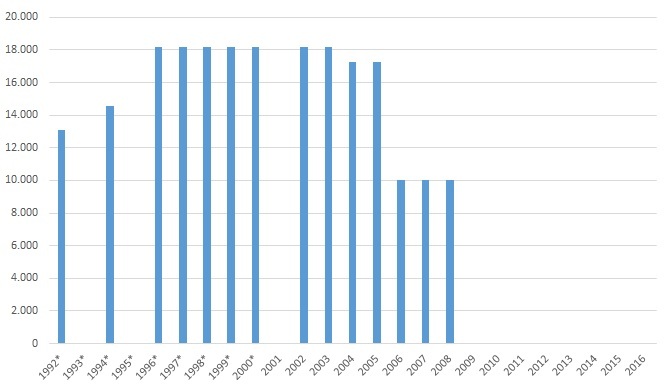 Figure 2 – Expenses for the “State Office on Sect Issues” spent by the State of Lower Austria between 2000 and 2016 (in EUR, *converted from ATS to EUR). On the original website of the GSK, the State of Lower Austria was named as sponsor of the association. However, explicit funds for the GSK have not been itemized in the public statement of accounts of the State of Lower Austria and thus it is not clear how much money in effect went to the GSK. However, it may be assumed that the subsidies for the GSK have been included in the item “Förderungsausgaben” (funding expenses). If this is the case, then at least 66,600 EUR or one third of the total budget for the Lower Austrian State Office on Sect Issues actually subsidized the GSK office in Vienna between 2000 and 2010 (see table 3). As figure 3 indicates, funding expenses of the Lower Austrian State Office on Sect Issues increased from 2000 onwards and reached a peak in 2003 (15,180.00 EUR). 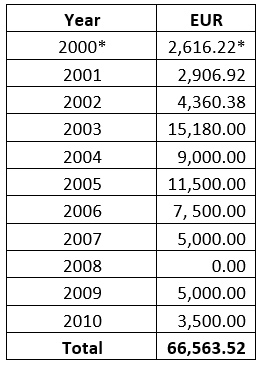 However, between 2005 and the last spending of funds in 2010 there has been a clear decrease in the amount provided for funding expenses that most likely impacted the GSK’s financial situation. From 1992 until 2010, the private anti-cult group GSK received in total at least 286,600 EUR of public funding through the City of Vienna and the State of Lower Austria. Although subsidization of this dubious association has been cancelled in 2009 and 2011 respectively, no explanation let alone an apology has been given to the public to date. between 2000 and 2010 (in EUR, *converted from ATS to EUR). If a certain group advocates a “unique ideology” that is mainly marked by “intolerance” as Martin Felinger, the executive director of the GSK, defined a “cult” or “sect”, then this is less of an academic description of the phenomena of New Religious Movements, but all the more an accurate self-description of his own association. The GSK’s lack of accountability in its methodology and specific modus operandi, its lack of objective criteria for measuring counseling performance and its lack of transparency in handling public funds only added to the dubious image of the anti-cultist scene at large. On the positive side, there is to date no evidence that Rollett and her disciples Müller, Felinger et al. have managed to breed a new generation of anti-cultists in Austria. Their unconvincing cause of stigmatizing minority groups and their subsequent loss of public trust and subsidies has made the GSK become a shadow of its former self. Meanwhile, prominent New Religious Movements that have been classically decried as “sects” by anti-cultists such as the Jehovah’s Witnesses (a recognized church since 07.05.2009) or the Unification Church (a registered confessional community since 15.06.2015) have already attained legal personalities as official religions. The main anti-cult protagonist in Austria that still receives public funding is the Federal Office on Sect Issues which receives 500,000 EUR annually. For several years the Federal Office has been keeping a low profile and omits any officially association with FECRIS. It only sporadically released reports in 2005, 2009, 2013 and 2014, but hardly ever documented cases of human rights violations committed by New Religious Movements in Austria. In the meantime, the number of the office’s staff members has been reduced from formerly 8 to 5 persons in 2012. However, while the operation of professional and publicly funded counseling centers for the information about religions – both traditional and new – and their possible problematic socio-psychological aspects would indeed be needed, what is troubling is that there is no public conversation about the shameful waste of public funds on pseudo-scientific anti-cult offices. For more than two decades, self-proclaimed experts have led a disparaging crusade against religious minorities at the cost of tax payers, but applied a thoroughly unconstitutional and academically unsound approach. And yet, the media and politics are silently looking the other way. Brünner, Christian/Neger, Thomas: FECRIS and its Affiliates in Austria – State and Mainline Religions against Religious Diversity, in: Besier, Gerhard/Seiwert, Hubert: Freedom of Religion or Belief, Anti-Sect Movements and State Neutrality. A Case Study: FECRIS. Religion – Staat – Gesellschaft. Zeitschrift für Glaubensformen und Weltanschauungen/ Journal for the Study of Beliefs and Worldviews 13. Jahrgang (2012), Heft 2. 307-339. Cf. Griess, Friedrich: Gesellschaft gegen Sekten- und Kultgefahren. URL: http://griess.st1.at/gsk/indexsave.htm [last accessed 10.11.2016]. The excerpt is available under the URL http://zvr.bmi.gv.at/ through the central register of associations code (ZVR) of 066524109. Felinger, Martin: „Sekten und destruktive Kulte“. URL: http://www.martinfelinger.at/taetigkeitsfelder/sekten/ ; “Zur Person”: URL http://www.martinfelinger.at/zur-person/ [last accessed 10.11.2016]. Telephone conversation on the 9th of November 2016. Cf. Brünner/Neger (2012), 320; see Informationsdatenbank des Wiener Landtages und Gemeinderates. URL: https://www.wien.gv.at/infodat/ergli [last accessed: 11.11.2016]. Cf. FOREF – Forum Für Religionsfreiheit Europa: Europäische Anti-“Sekten” Organisation FECRIS: Probleme mit Demokratie und Menschenrechten. Press Release, 29.06.2005. URL: http://www.ots.at/presseaussendung/OTS_20050629_OTS0031/europaeische-anti-sekten-organisation-fecris-probleme-mit-demokratie-und-menschenrechten [last accessed: 11.11.2016]. Cf. Pitzinger, Peter: Staatliche Beobachtung von religiösen Gruppen und die Religionsfreiheit. Vorstellung des österreichischen Modells. [Lecture given at the general assembly of FECRIS in 2007.] URL: http://griess.st1.at/gsk/fecris/pisa/Pitzinger_DE.htm [last accessed 10.11.2016]. In a press release on the 15th of September 1997 the state government of Lower Austria invited to an information event on sects where German Müller would give a presentation on the “parents initiative”(!) GSK. Cf. Sekten – Wissen schützt. Landesstelle für Sektenfragen informiert. URL: http://www.ots.at/presseaussendung/OTS_19970915_OTS0101/sekten-wissen-schuetzt [last accessed 10.11.2016]. URL: http://griess.st1.at/gsk/indexsave.htm [last accessed 10.11.2016]. Bundesministerium für Finanzen: Ausgliederungen und Beteiligungen des Bundes Bericht gemäß § 42 Abs. 5 BHG 2013. Oktober 2015, p. 31. URL: https://www.bmf.gv.at/budget/das-budget/Ausgliederungen_und_Beteiligungen_des_Bundes_Oktober_2015.pdf?5i7zdn [last accessed: 11.11.2016]. This entry was posted in Anti-Cult Movement, Austria, Countries, FECRIS, FoRB Violations, Human Rights, Persecution of Religious Groups, Religious Discrimination, Religious Freedom, Sects and tagged Austria, Bundesstelle für Sektenfragen, FECRIS, Religious Freedom. Bookmark the permalink.